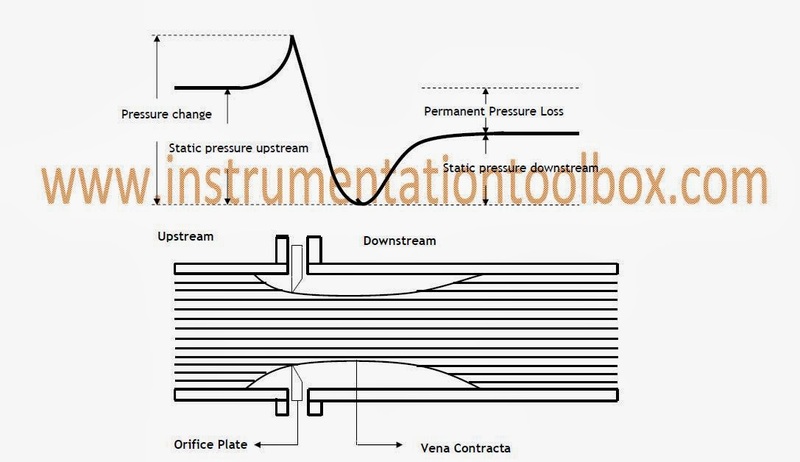 As discussed in flow instrumentation: principles and formulas, when there is a flow restriction in a pipe, a differential pressure results which can then be related to the volumetric flow rate through the restriction. The principle of a flow restriction creating a differential pressure is what is used in the orifice meter to measure the flow rate of liquids, steam and gases. 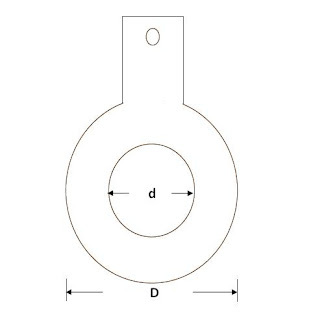 (b) A secondary device that measures the differential pressure created by the orifice plate. the Beta Ratio (β ). The orifice plate has a typical bore diameter that ranges from 30% to 75% of the inside diameter of the pipe work in which it is installed. A beta ratio of 0.4 signifies that the orifice bore diameter is 40% of the pipe inside diameter. With an orifice plate installed in a flow stream, increase in fluid flow velocity through the reduced area of the orifice develops a differential pressure across the orifice. The differential pressure generated is related to the beta ratio of the orifice plate.The smaller the beta ratio, the higher the differential pressure generated. In practice, the choice of beta ratio is a compromise between the differential pressure desired and the flow rate required. 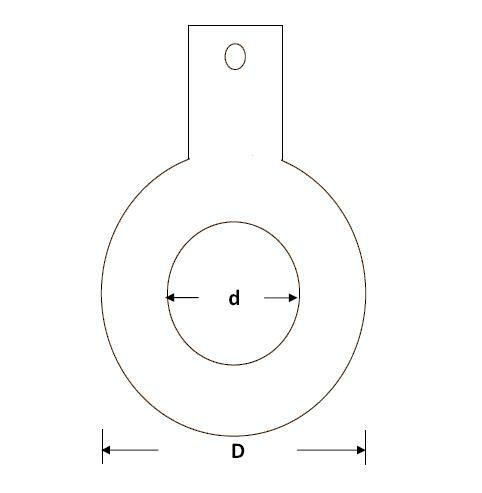 Flange taps are the most common and are generally used for pipe sizes of 2 inches and greater. Flange taps are a convenient alternative to drilling and tapping the main pipe for pressure connections. Vena contracta taps are limited to pipe sizes greater than 6inches. This limitation is mainly imposed to provide adequate clearance of the tap from the flange. The vena contracta is where the fluid flow has the smallest cross-sectional area, and also has the lowest pressure. Vena contracta taps are designed around achieving the maximum differential pressure. The vena contracta is dependent on the flow rate and pipe size, and can vary should either of these parameters change. The vena contracta taps will therefore be affected should the flow rate or pipe size change. Pipe taps are located 2.5 pipe diameters upstream and 8 pipe diameters downstream of the orifice plate. Pipe taps are used typically in existing installations, where radius and vena contracta taps cannot be used. They are also used in applications of greatly varying flow, as the measurement is not affected by flow rate or orifice size. Accuracy is reduced, as they do not measure the maximum available pressure. Corner taps measure the pressure in the corner between the orifice plate and the pipe wall. Uses for corner taps are found in installations with pipe diameters less than 2 inches. Radius taps are a modification on the vena contracta taps, where the downstream tap is located one-half pipe diameter from the orifice plate. This is to avoid the unstable region that occurs immediately after the orifice plate. Radius taps are generally preferred to vena contracta as the pressure tap location is simplified. As noted earlier, the other major component of the orifice meter is the secondary device. The secondary device is often a differential pressure transmitter called a flow transmitter when installed to measure flow. The flow transmitter measures the differential pressure created by the orifice plate in the flow stream. This differential pressure is measured via impulse lines located upstream and downstream the orifice plate. The impulse lines are connected to the high and low pressure ports of the transmitter which then converts the differential pressure measurement into an analogue (4 -20 ma) or digital signal which can be processed to provide a display of the instantaneous rate of flow. They have a simple construction. They are easily fitted between flanges. They have no moving parts. They are suitable for most gases and liquids. They are well understood and proven. Price does not increase dramatically with size. Inaccuracy is typically in the range of 1%. They have Low range-ability, typically 4:1. Their accuracy is affected by density, pressure and viscosity fluctuations. Erosion and physical damage to the restriction affects measurement accuracy. Their installation causes some unrecoverable pressure loss. Fluid viscosity limits measuring range.